Lubricants for industrial equipment are tasked with many different functions, including protecting against corrosion and wear, transferring contaminants to filters or dissipating heat from hot zones. Most lubricants have specific conditions where they may become flammable, such as when flames, sparks or hot surface conditions occur. This is mostly derived from the lubricant’s base oil properties. For this reason, these specific lubricant properties and environmental conditions must be understood and controlled. More importantly, the lubricant should be selected appropriately with the necessary properties to mitigate the potential risks. This is where lubricants called fire-resistant fluids are put into service. Fire should always be a consideration when equipment operates with a lubricated component. However, the risk of fire may be highest when the lubricant in use has a poor flash point and the ignition source or hot surfaces are nearby. When lubricants are pressurized, such as in hydraulic lines, there is a risk of small leaks and a fine spray of lubricant being atomized into the air. These leaks can be the result of component failure at points such as joints, worn hoses and seals, particularly if the systems have recently undergone service or have been operating for a long period of time. When a leak occurs and fluid sprays, the system becomes more susceptible to fire-related risks. If these pressurized systems operate in an area where there are open flames or near equipment running at high temperatures, such as in steel mills, drum dryers or ovens, a perfect storm of conditions exists that could lead to a catastrophic fire. The initial combustibility can originate from the fluid or the vapors produced by the fluid. In these high-risk environments, lubricating fluids are designed and specified to meet fire-resistant standards. Examples of industries and equipment where these fire-resistant fluids are recommended include die-casting (presses, mobile equipment kilns and die-casting machines); foundries (furnace controls, molding and coring machines); metalworking (furnace controls, rolling mills, welding machines and hydraulic equipment); forging/extrusion operations (presses and mobile equipment); mining (conveyors, car equipment and continuous mining equipment); and power plants (electrohydraulic control systems and steam/gas turbines). The types of hydraulic fluids are categorized and defined within the ISO 6743-4:2015 standard. Those with fire-resistant properties, commonly called fire-resistant hydraulic fluids (FRHF), are nested within this standard and broken into six categories: HFAE, HFAS, HFB, HFC, HFDR and HFDU. 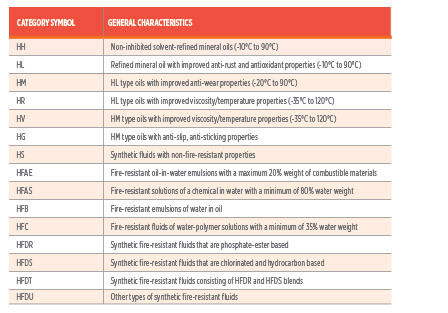 These fire-resistant hydraulic fluids, along with the HFDS and HFDT categories, are shown in the table on the right. These emulsions are formulated to sustain small droplets of oil dispersed in water with constituents of 95 percent water and 5 percent oil. With the vast majority of the formulation containing water, there are distinctive tradeoffs in comparison to a typical hydraulic oil. This level of water content may offer excellent fire resistance and heat-transfer capabilities, but this results in poor lubricity properties and loss of natural corrosion protection. Oil-in-water emulsions tend to rely on additives to provide a more appropriate level of corrosion protection. Due to their low viscosity and limited wear protection capabilities, they tend to be used only in special applications that have low lubricity requirements. These are called inverse emulsions where the oil is in the majority. Small water droplets are dispersed in oil with constituents of 40 percent water and 60 percent oil. This formulation provides a more balanced package with good fire resistance and excellent heat-transfer capabilities. 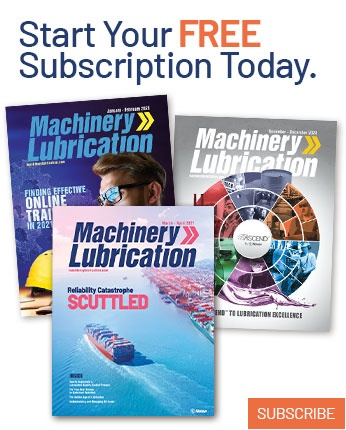 Although these emulsions have better lubricity and corrosion protection than oil-in-water emulsions, additives are still needed to meet the minimum lubrication requirements for most applications. Water-in-oil emulsions have a milky appearance and are commonly manufactured with viscosities between 100-120 centistokes and a specific gravity of 0.92. Like other water-based, fire-resistant hydraulic fluids, the fire resistance is primarily accomplished by the water in the formulation. When exposed to high temperatures, the water turns into steam, which reduces the oil’s combustibility. These emulsions also maintain water droplets at a small enough size so that filtration is still an option. Often called water-polymer solutions, these are formulated with 60 percent glycol and 35 percent water. The glycol-based lubricants in these solutions offer some benefits, such as a lower freeze point, while the fire resistance and heat-transfer capabilities are provided by the water. They also require additives to supply sufficient lubricity and protection from corrosion and wear. Glycol can impart a higher natural detergency and viscosity index than most other base oils. However, there is a risk of incompatibilities to other fluids, paints and coatings, as well as a tendency of shear thinning when viscosity-index improvers are used. Synthetic phosphate-ester base oils are some of the most fire-resistant lubricant formulations. They gain inherent fire resistance from the properties of their molecular structure. Phosphate esters are noncorrosive, have excellent oxidative stability and anti-wear characteristics, and provide operability up to 150 degrees C. They also have good lubricity, particularly in boundary conditions, and are often produced with viscosities of 22 to 100 ISO VG. Their specific gravity is higher than water. However, phosphate esters have a very low viscosity index (less than 60) and are susceptible to hydrolysis. They are frequently used for aluminum die-casting machines, melting furnaces and steel mill applications. Other synthetics, such as polyolester and polyether glycols, have varying capabilities as fire-resistant hydraulic fluids. For the purposes of fire resistance, these may not be as common as other mainstream fluids, although they may offer unique advantages, such as a higher viscosity index and excellent lubricity. 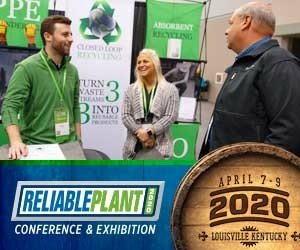 Some alternative options are formulated with natural esters for enhanced biodegradability, low toxicity properties and a higher flash point than other non-aqueous fire-resistant fluids. Specialty fluids like these are often delivered with a high cleanliness level, which is important when trying to meet standard cleanliness targets for servo-controlled hydraulic systems. Factory Mutual (FM) provides approvals and certifications for various fire-protection equipment. Industrial fluids are tested using the FM 6930 standard to classify their flammability characteristics. These evaluations can clarify the limitations of certain hydraulic fluids employed in applications where fire-resistant properties are required. The FM 6930 standard approves lubricants that meet one of the three levels of rating requirements, identified as group 0, 1 or 2 (shown above). Keep in mind this standard is limited to flammability and does not include any other considerations of the fluid or lubricant. These flammability characteristics are tested using the following performance criteria: determination of the chemical heat-release rate of a highly atomized spray of the fluid, measurement of the critical heat flux for ignition of the fluid, and calculation of the fluid’s spray flammability parameter (SFP). Emulsion-based fluids must also meet the requirements of the separation resistance evaluation. Any formulation with higher amounts of water will be more prone to bacteria and other microbial growth. Biocide treatments should be carefully balanced in these systems, especially for oil-in-water emulsions with 95 percent water. In emulsions, the ratio between water and the base oil should be monitored to preserve effective fire resistance. Maintaining a suitable water level will require periodic testing. When restoring the desired amounts of water, always consult the lubricant manufacturer’s specifications and any corporate standards that govern fire-protection protocols. Water-based fire-resistant hydraulic fluids should also be periodically checked for their pH levels, corrosiveness, wear protection, controlled storage conditions and shelf life. As with most lubricants in industrial applications, fire-resistant hydraulic fluids should be kept clean, cool and dry. The oxidative and thermal stability will vary greatly among the different types of fluids. Care should be taken to keep oil within the acceptable temperature ranges. Oil analysis is often necessary to check for abnormal levels of contamination, undesirable water concentrations, acid number fluctuations, wear debris, or other changes in the physical or chemical properties of the base oil and additives. Environmental factors should also be considered when managing the reservoir and other ingression points. Contaminants can easily enter the system when fluid is drawn from the reservoir during operation. These contaminants not only can impair the equipment’s functionality but can even alter some fire-resistant properties. Breathers with desiccants and particle filters should be sized appropriately to protect the oil from these airborne contaminants. Don’t forget to seal off the headspace entry points. Otherwise, air will simply flow along the path of least resistance, which may not be through the breather element. Filtration is crucial for maintaining the longevity of most hydraulic systems, particularly valves, actuator seals and pumps. Fire-resistant hydraulic fluids can be managed in much the same way, even those that are water-based. First, meet the minimum filtration requirements and limitations defined by the manufacturer of both the equipment and the hydraulic fluid. Then, make any appropriate adjustments to these recommendations to satisfy the cleanliness targets established by your reliability program. A lubricant changeover in any application should not be completed without careful consideration of the degree of cross-compatibility and amount of residual fluid in the system. Upgrading to a system with a fire-resistant fluid or changing to a different type of base oil will require additional attention. Always drain the fluid while the system is still warm and make every effort to purge all fluid from any low pockets, nooks and crannies. Replace all filters and any other components that have saturated amounts of residual fluid. When changing to a different fluid, always consider the compatibility of the seal materials, paints and other coatings, especially for synthetic-based fluids. It’s generally advisable to circulate an appropriate flushing fluid under minimal to no load to pull as much remaining oil from the previous fill. Afterward, fill the system to the correct fluid level with the specified fire-resistant fluid. The ISO 7745 standard provides general flushing and changeover procedures as well as specific change considerations for viscosity, lubrication, density and compatibility concerns for every base oil combination of fire-resistant hydraulic fluid. Also, always check with the fluid manufacturers for compatibility information. 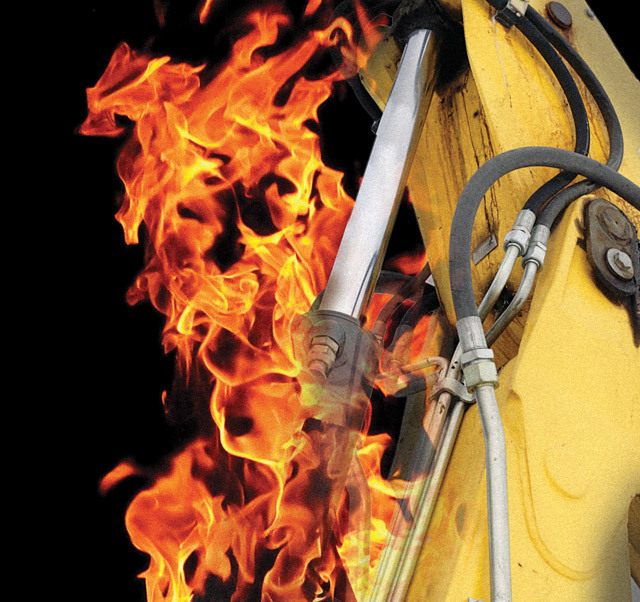 Hydraulic fluid requires a unique lubricating ability that can work under pressure and mitigate an array of risks, including fire. These risks and the mode in which the fluid operates at higher pressures can make it easy to justify the use of a fire-resistant fluid. The base oil will be crucial, whether it is a synthetic such as a phosphate ester, which naturally resists combustion, or a water-based fluid, which relies on water vaporization to create steam and smother any imminent fire potential. Townsend, F. and Baker, P. “Factors Relating to the Selection and Use of Fire-Resistant Fluids in Hydraulic Systems.” Hydraulic Pneumatic Power, April 1974. ISO Standard 7745. Hydraulic fluid power – Fire-resistant fluids – Requirements and guidelines for use. Jagger, S., et. al. 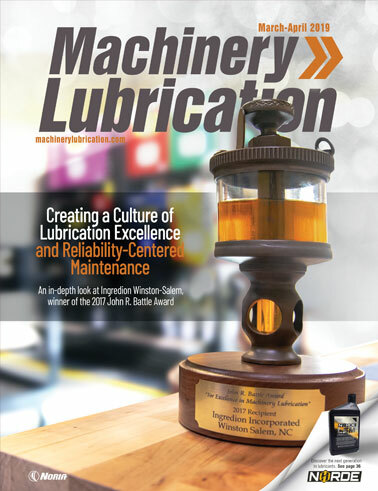 “Assessing Hydraulic Fluid Fire Resistance.” Machinery Lubrication, September 2007. FM Global Technologies LLC, Factory Mutual, Approval Standard for Flammability Classification of Industrial Fluids. Class Number 6930, January 2002.